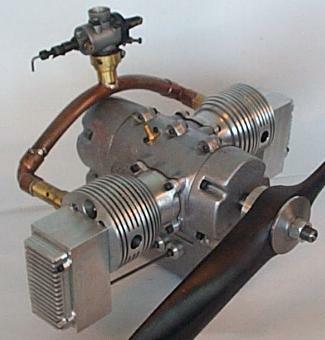 A carburetor was added to a manifold of copper and brass tubing. Nothing elaborate here. The tubing was soldered to plain copper elbows from the plumbing dept. The carb. is one that I had left over from an ASP .75 R/C airplane engine. I think it may be a little bit too big. I my add a restrictor in the venturi. I think this is why I have trouble getting the carb. adjusted properly. More testing must be done. During the first runs, there was a lot of oil being pumped out the exhaust. Did I mention that the first couple of runs were made before the oil rings were installed on the pistons? OK,... so I expected a lot of oil in the exhaust. Now the rings have been installed and after running again, there was a very BIG difference. Oil rings do work. There is still a little oil getting by, but I don't think it is enough to cause any problems. Just a little smoke. The rocker boxes had to be remade due to some errors in construction (Dang rookie machinist). The crankcase pressure will be piped to each rocker box (for lubrication) and each rocker box will have a vent. Hopefully this will help keep the oil inside the engine. After the vents and pipe connections are made, the cooling fins will be cut into the rocker boxes and final shaping will be done. Before the first run, I added a tap into the oil feed of the main bearings. I want to be able to monitor the oil pressure. I drilled through the casting from the outside, and into the oil line, but not all the way through. I then added a fitting that I can attach a pressure guage to. Before I added the oil rings, the engine would empty the oil supply before it could empty an 8 ounce fuel tank. The pressure guage lets me know when the oil supply is low. After inital runs were made, I started looking for oil leaks, and there were plenty. I connected a very low pressure (2 or 3 psi) air to the crankcase and used some liquid soap to find the holes. I found that some of the aluminum castings are slightly porous. I found 2 places where oil was leaking through the casting. I am not sure how to seal these holes. Maybe Super Glue, or locktite or paint the inside of the casting. I did add some o-rings to the valve lifters. They seemed to be leaking pretty good, but the o-rings took care of that problem. The engine is still using the preliminary crankshaft. It is made from hot rolled steel. I have purchased a piece of 4140-B7 steel to construct the final crank from. All of the running to date has been made with the engine strapped solidly to the work bench. Any vibrations from imbalance don't show up too much this way. So I don't know if the engine is bad out of balance or not. I think that its current state is fairly well balanced. Again, more testing. The current camshaft was constructed from the timing values published in RCM December 2002, pages 24 and 26. This is an engine review of the Saito FA 200Ti, a 2 cylinder, 2 C.I. engine. I have used this as a comparison for my engine. The first camshaft (the one that I made wrong) was constructed from timing values that I got from Dave Bowes, used on his EVIC-111. His engine does not use a camshaft, but has electrical solenoiods to operate the valves. When comparing the two camshafts (the new one and the bad one), I noticed that the lobes made from the EVIC-111 timing values were very sharp. Like the duration was too short. I would have really liked to try it just to see if the performance would have been as good. Maybe when I get more testing out of the way I can make a new one with his timing values again and see how well it works. The current cam is working really good so far, and I don't plan on making a new one any time soon. I still need to make the exhaust pipes and mufflers. The distributor is still on the back burner until I get most of the problems ironed out. Then I want to go to a spark ignition. This is where I will (or maybe 'will not') make the distributor. I hope that it is not something that is beyond my reach. Preliminary testing on parts that I have made look promising for function, but I am not sure about reliability. The engine is approximatly 6 pounds dry. I used an old postal scale that is not too accurate. I plan to take it to the Post Office one day and have them weigh it. Six pounds is about double the weight of the Saito engine. I plan to put this engine on a plane and the extra weight of this engine may be a problem. I am thinking about building 'Ryans Rebel' from RCM December 2002. Close this window to return to the Progress page.